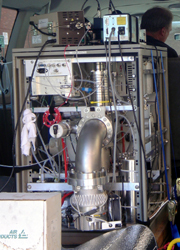 The MACL trailer houses a suite of instruments for field research on atmospheric aerosols. This mobile laboratory allows simultaneous measurements of gas phase species, particulate phase chemical and physical properties, and boundary layer dynamics in an integrated approach for aerosol studies. The major research instruments are an aerosol LIDAR to measure vertical profiles of aerosols and clouds, a Scanning Mobility Particle Sizer to measure particle size distributions, a Particle in Liquid Sampler/Ion Chromatograph for collection and chemical analysis of water-soluble ionic components, and a Gas Chromatograph/Mass Spectrometer for the quantification of gas phase precursors of ozone and aerosols. MACL deployed at the University of Michigan Biological Station during CABINEX, 2009. GC / MS field instrument: An automated gas chromatograph - mass spectrometer for in-situ sampling and analysis of VOCs in ambient air. This is a custom field deployable system that uses a cryogenic preconcentrator to sample ambient air. Detection limits are in the low pptv with a sampling frequency of ½ hour. Canister sampling and analysis by GC-FID / ECD: We have over 100 canisters for grab sampling and several gas chromatograph detector combinations for analyzing canister samples. Infrared Gas Analyzers: A fast response open path infrared gas analyzer (IRGA) for eddy covariance flux measurements of CO2 and H2O (OP-2 from ADC Bioscientific Inc.). Fast Olefin Sensor: A real time instrument from Hills scientific, Inc. for measuring olefin concentrations in air. Detection limits are sub ppbv for 10 Hz sampling rates. Trace Gas Automated Profiling System (T-GAPS): An automated, continuous, multi-inlet tracer sampling and analysis system. T-GAPS is designed to provide simultaneous, 5-minute average concentratons measured at 7 locations on a continuous, automated basis. 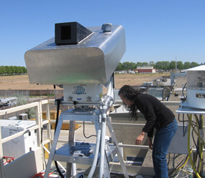 EC/OC Instrument: A Sunset Laboratories instrument for measuring elemental and organic particulate mass concentrations. Aerodynamic Particle Sizer: TSI instrument for measuring particle size distributions from 0.5 to 20 um. DustTRAK nepholometer: TSI instrument for measuring particulate mass less than 10 um. Particle Filter Samplers: Multiple samplers for collecting filter samples for laboratory analysis. Partisol and TEOM instruments: Thermo Electron instruments to measure particle mass. MF-DOAS: The Multi-Function Differential Optical Absorption Spectroscopy instrument. The MF-DOAS instrument allows vertical and horizontal "mapping" of trace pollutants by taking measurements in four directions(north, east, south, west). The instrument is used to validate measurements obtained by the Ozone Monitoring Instrument onboard NASA's Aura satellite. Short-Path DOAS: A portable short path Differential Optical Absorption Spectroscopy instrument housed in a portable cart and mounted on tripods. The equipment includes a Xenon light source, transmitting and receiving optics, a Czerny-Turner spectrograph, and computer. 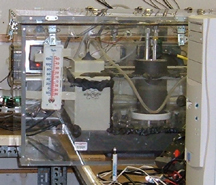 The instrument is currently being used to make mid-ultraviolet measurements of ammonia. We are currently employing fast isotopic measurements based on Fourier Transform Infrared (FTIR) Spectroscopy coupled with the disjunct eddy covariance (DEC) flux technique. The FTIR-DEC technique is a novel approach for making real-time direct measurements of total CO2 flux and isotopic CO2 fluxes in a forest ecosystem and can potentially be used for continuous investigation of biosphere/atmosphere interactions. 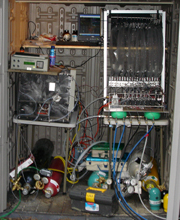 The instrument captures 24hr/day measurements of CO2 concentration, isotopic del values, and isotopic CO2 fluxes on 34 second centers, all automatically under computer control. We have disjunct eddy accumulation (DEA) or disjunct eddy covariance (DEC) capabilities for various compounds including urban emissions (VOCs), biogenic emissions (i.e., isoprene, monoterpenes), and agricultural emissions (i.e., N2O and CH4). DEA set up in Mexico City during the MILAGRO field campaign. We have a full suite of meteorology and micro-meteorological instrumentation including complete weather stations (Campbell scientific, Vaisala WXT, etc. ), sonic anemometers (Applied Technologies, Inc.), net radiometer (CNR-1 from Kipp and Zonen), photosynthetic absorbed radiation (PAR) sensors (Li-Cor, Inc.) and associated data acquisition systems. We have standard instruments from Thermo Electron to measure O3, NOx, NOy, CO, and SO2. These are maintained and calibrated according to respective EPA protocols. Trace Gas Automated Profiling System (T-GAPS) is an automated, continuous, multi-inlet tracer sampling and analysis system. T-GAPS is designed to provide simultaneous, 5-minute average concentratons measured at 7 locations on a continuous, automated basis.